Hey, everybody! Antoni, here, with another piece of fanart I made. This time it’s Inuyasha with three of my most beloved and favorite OTPs. From left to right we have Inuyasha/Ayame, Ginta/Shunran, and Kohaku/Rin. I aged them up to what I would think they would look like this year, even though I did make them look a lot younger than I expected them to look. In this picture, Inuyasha is 35, Ayame is 32, Ginta is 33 going on 34, Shunran is 31, Kohaku is 29, and Rin is 25 going on 26. 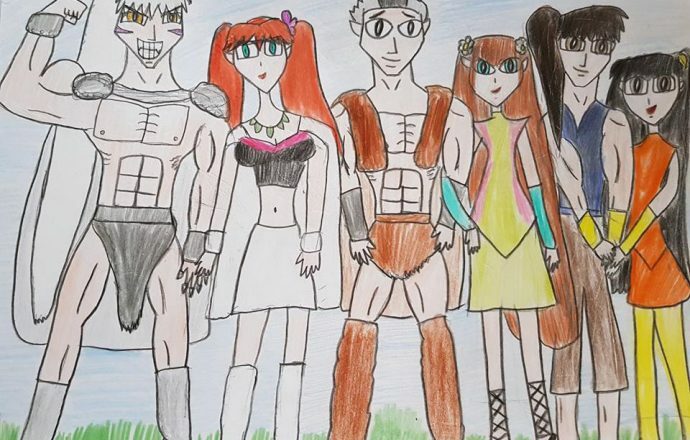 Yes, I know I could’ve also drawn Sesshoumaru/Kagome, Miroku/Sango, Shippou/Souten, and Souta/Kanna, but there was apparently only room for three couples in my sketchpad. Moreover, I am a bigger Inuyasha/Ayame, Ginta/Shunran, and Kohaku/Rin fan because not only do I find these pairings absolutely adorable, but also plausible in their own ways. So, let’s not waste any time and talk about these respective pairings. Given the amount of Inuyasha/Ayame fanfics, I have been recommending and, of course, reviewing, it should come off as no surprise that these two are my OTP for life. From the bottom of my heart, I always knew that Inuyasha should’ve ended up with someone more compatible. I mean, if I were in his position, I would move on from Kikyou, stay the absolute heck away from Kagome, and just settle with someone as tough, strong, and kickass like Ayame. Additionally, if I were in Ayame’s position, I should just let Kouga keep Kagome and I can run off with Inuyasha, with good old gramps giving his approval to someone as sturdy, strong, and steadfast like him. In terms of Inuyasha’s outfit, I did promise I was going to make something out of it after I reviewed darling krash’s fanfic A Hint of Hope, and I had an idea of how it should look. Since Inuyasha is essentially a warrior suitable for Ayame to be her loyal husband, I decided to make him look a little more tribal and dress like one of the wolf youkai, even though Inuyasha is a dog hanyou. Speaking of which, I decided to tap into Inuyasha’s full youkai side without the overall bloodthirsty nature he has in that state and make him have enhanced physical strength, given his physicality here. I also imagine him doing more hand-to-hand combat, as well as using his claws to take down his enemies. Overall, it was such a joy making a more muscular, more mature-looking, and more warlike Inuyasha, it was really envisioning him as this type of warrior. Moreover, I did keep Inuyasha’s trademark badassery, which was one thing about him I found so endearing. Ayame was also a joy to draw. I kept her signature outfit and I also decided to make her a little bit more womanly though still keeping her youth and vivacity. I can certainly see Inuyasha and Ayame fighting side by side on a battlefield and they will come home as the champions. After all of that, it’s a whole night of hot and steamy intimacy. I also envision them having children of their own, what with Inuyasha being the strong, no-nonsense, strict, yet open and cool father and Ayame being the supportive, well-meaning, and strong-minded mother. That also gives me an idea of making their fan-children. Overall, is there anything else I need to say about why I not only fancy the pants off of Inuyasha/Ayame but also love them as a couple? In my mind, they were definitely made for each other. I have been toying with this idea of these two being together for many years. All of the sudden it hit me. No one has even thought about pairing these two together other than me. So, I guess it was up to me to give this coupling the light of day. Since I always saw Ginta’s and Hakkaku’s relationship as more platonic, as they act like fraternal twin brothers with their antics and chemistry, I thought to myself, why not give these two guys some lovely women to be their life partners. On the flipside, the Panther Devas, especially Toran, Karan, and Shunran, have been my favorite Inuyasha filler anti-heroes because of how well they work as a unit and just how fun they are in terms of their personalities. So, I kind of came to the conclusion that Ginta might as well take Shunran to be his mate and Hakkaku can take Karan. As I stated before in my fanfiction recommendation of “An Odd Pair” by JapanLurve101, I like the idea of Ginta and Shunran being together. When you have a nice, kind-hearted, hilarious, and sweet soul like Ginta pair up with someone as mischievous, spirited, vivacious, and cheeky like Shunran, it can actually make for a really adorable yet plausible pairing. At first, they might not agree on a lot of things and may have their own trust issues, but as soon as he sees Shunran in danger, I can imagine Ginta bucking up and saving her. Through time, they will actually grow to like each other, in spite of how different they are with Ginta being a wolf youkai and Shunran being a panther youkai. They will very much challenge and break the system, thus running off together. Plus, I am sure they will have a lot of great interactions with Ginta thinking that Shunran is cute, bubbly, and fun-loving and Shunran thinking that Ginta is hilarious, strong, and charming. With Ginta’s outfit, it is a variation of his trademark one in the anime though I did make a few changes to expose parts of his chest and torso. In terms of his personality, I see him being a lot more independent and strong while still being the gentle, goofy, and kind soul that he’s always been. Plus, he has beefed up a bit as he got older. With Shunran, I made a variation on her outfit while still keeping her trademark colors, as well as the two flowers on her hair. I kept her peppy, youthful countenance and her feisty nature while making her slightly more grown-up. I can see their relationship developing from puppy love as teens to genuine love as they reach adulthood. They will even bring out the best in each other and they will support each other without respite. In terms of them being parents, I see Ginta as the light-hearted, goofy, yet well-meaning dad and Shunran as the nurturing and good-humored mom. Overall, Ginta/Shunran certainly has a great amount of potential to happen. As I stated before, their relationship will develop from being cute and cuddly to well-meaning, genuine, and sincere as they grow up. Even as I watch Inuyasha, I have been rooting for these two to be together and I always saw Sesshoumaru’s relationship with Rin as more aloof adoptive father with his jolly, young adoptive daughter. Sure, Kohaku was under Naraku’s control before he met Rin and he did commit atrocities. However, if I were in his position, I would ditch the likes of Naraku, Bankotsu and the Band of Seven, and Hakudoushi, move away from the past and put it behind me, join Sesshoumaru’s troupe, gain his trust and be in his service, and eventually get Rin’s hand in marriage to lead a happier life complete with Lord Sesshoumaru’s blessings. It’s safe for me to say that out of all the pairings in Inuyasha, I actually found Kohaku and Rin to be not only compatible but the best couple by default. They start off as friends and there’s even the potential for them to truly happy with each other without any animosity in their relationship. I gave Kohaku slightly simple clothing and I will admit he does look a little bit like a Kung-Fu warrior. Given his whole demon slayer stint, I decided to bulk him up a bit, as he does a fair amount of fighting. I also kept that air of mystery about him, while making him that altruistic person that has always been deep down. Yes, I did make Rin petite for someone who is supposed to be 25 years old. I don’t see her as the one being skimpy or provocative or sexualized. I see her more as someone who is still jovial, fun-loving, endearing, essentially a kid at heart, and the joy and the laughter much like Bubbles. In terms of her outfit, yes, I did make her and Kohaku a sort of Kung-Fu fighting demon pair. I can certainly see that happen with the pair of them starting a dojo for aspiring young demon hunters and slayers, that will make the likes of Sesshoumaru, Sango, and Kagome proud. Plus, I can see Kohaku, Rin, Shippou, and Souten being really good friends, with Rin caring about her younger adoptive brother, Shippou, so much. In terms of being parents, I think it can work with Kohaku being a stern yet approachable dad and Rin being a nurturing and loving mom. Again, I have to make fan-babies. Overall, I definitely enjoyed drawing these three kickass OTPs. They seem to mesh with each other personality-wise and I really enjoyed each of them as characters. 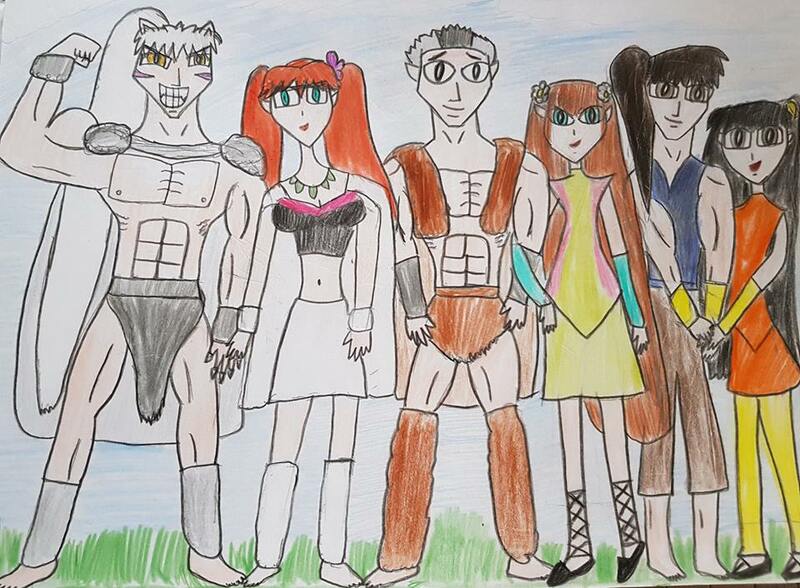 Thank you so much for having a gander at this piece of Inuyasha fanart and until then, have a great spring.